Here’s a thing – or not. Cra has been operating at Grade 1 Challenge for 20 years or so. Fast pace, rapid ascents, clattering descents and on and on. – and has learned and self-taught many useful techniques to start, develop and maintain this level. Now he has got a bit busted ‘round the edges and can’t do top-end any more; but he would like to pass on these techniques to aspiring/existing challengers and also to any serious hillwalkers from Grade 2 upwards who would like to be a leaner, meaner and most important, faster walker. This means you can compete better (if you want to) or simply just be first to the summit to enjoy, take photographs and snooze while the others catch up. Cra is thinking about challenge training for anyone interested. Free of course – at least to mountainviewers. 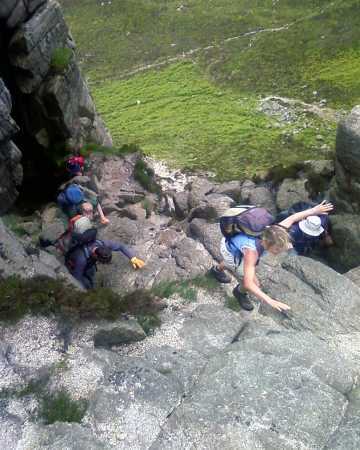 It would be one to one or v small groups – ideally in the Mournes or could be on a patch near you. If you think you would be interested in this, let him know on douglasreid@utvinternet.com If I get enough interest I will put something together.